He made a career of taking things that were not rightfully his. He spirited away other men’s women, stole money, and sometimes even the limelight, from right under the hero’s nose. 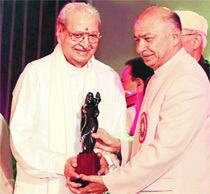 And yet, last week when Pran walked away with the Lifetime Achievement Award instituted by the Maharashtra Government, no one could argue that this time he had got what was his rightful due. The villain, as much as the hero, is an integral part of Indian movies. He imparts the necessary mirchi flavour to the mandatory masala mixture. He is also the perfect foil to the hero’s impeccable character. Little wonder, then, that Pran acted in almost every major Bollywood release for decades, especially in the 1960s and 1970s. With his bloodshot eyes, his cold voice and his trademark sneer, he brought villainy centre stage. He was a consummate performer whose very presence on the screen struck terror in the hearts of generations of filmgoers. He gave a new face to wickedness without resorting to the sartorial support — exaggerated make-up, bizarre attire — that became the hallmark of later villains, for instance Amrish Puri’s Mogambo or Anupam Kher’s Dr Dang. He could appear wicked in a three-piece suit and professorial glasses. The original suave gentleman villain. In a career spanning more than 60 years, he did hundreds of films. While he is mostly remembered for his bad guy roles, those are not the only kind of characters he essayed. Two of his best-known roles were positive ones: in Manoj Kumar’s Upkaar, and as Amitabh Bachchan’s loyal friend Sher Khan in Zanjeer. He was perhaps the first villain to make a successful crossover to positive roles. His intensity, evident though it was in his evil screen persona, was unmistakable when he was playing the good guy. Lahore was the hometown of the famous villainous trio of Pran, Ajit and KN Singh and Pran did his first films in the city in the 1940s. He was learning still photography when a chance encounter with well-known fimmaker Mohammad Walli changed his life. Walli felt that he had an interesting face, and recommended him to Dalsuhk Pancholi who gave him the role of a villain in Yamla Jat, a Punjabi movie, in 1940. This was followed a year later by another Punjabi movie, and another negative role in Chaudhary. In 1942, Pancholi made Pran the hero in Khandaan. Following Partition, Pran, accompanied by his wife and 18-month-old son, came to Bombay, where he had to start from scratch. He had almost given up the hope of continuing a career in films when he ran into writer Saadat Hasan Manto, who together with the late actor Shyam, got him a role in Ziddi, in which Dev Anand and Kamini Kaushal played the lead roles. From then on there was no stopping him and he went on to give one memorable performance after another. 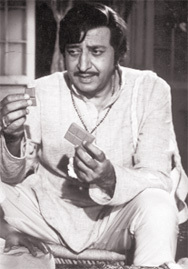 He acted in blockbusters like Jis Desh Mein Ganga Behti Hai, Madhumati, Dil Diya Dard Liya, Purab aur Paschim, Ganga ki Saugandh, Don, Amar Akbar Anthony, and Naseeb. For his contribution to cinema he revecived numerous awards, among them the Stardust Villain of the Millennium Award in 2000 and the Padma Bhushan in 2001.